VATICAN CITY (CNS) — The three months of protests in Ukraine that ended with government snipers killing dozens of people strengthened the commitment to democracy of many Ukrainians, but also left the country vulnerable to further violence and division, said the head of the Ukrainian Catholic Church. 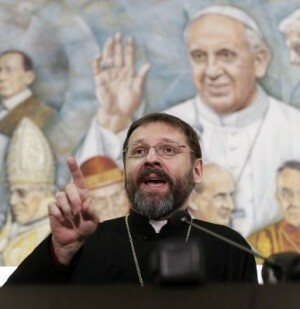 “The danger that our neighbor (Russia) will provoke a civil war has not passed,” Archbishop Sviatoslav Shevchuk of Kiev-Halych told reporters in Rome Feb. 25, adding that the protests have solidified the Ukrainian people’s commitment to independence, freedom and democracy. Bishop Hlib Lonchyna, head of the Ukrainian Catholic Eparchy in England, told Catholic News Service, “Our church stayed with the people as the struggle widened from a political one over integration with Europe into a larger one for basic human rights and dignity. Snipers opened fire on protesters in Kiev’s Independence Square Feb. 19, killing at least 70 people. President Viktor Yanukovich, who sparked the protests by deciding not to sign an agreement with the European Union but forge closer ties with Russia, left Ukraine’s capital Feb. 21, and the country’s parliament voted to remove him from office the same day. The archbishop described himself “as an eyewitness” to the protests and insisted it was untrue that the protesters were “extreme nationalists.” At first, he said, they were students who dreamed of living in a “free, democratic and European” Ukraine. When the government tried to use force to end the protest in December, he said, people from all walks of life started joining the students to say, “No to corruption, no to dictatorship, no to the denial of human dignity,” and yes to citizens’ right to decide the future of their country. 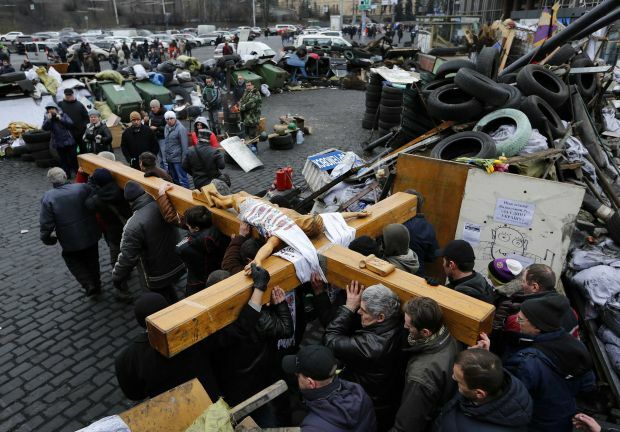 Throughout the protest, the archbishop said, the All-Ukrainian Council of Churches and Religious Organizations supported the protesters’ objectives, pleaded for them to remain peaceful and tried to mediate between them and the government. The council, he said, includes Catholic, Orthodox, Protestant, Jewish and Muslim representatives. Those seeking power, however, see the diversity as something to exploit for their own purposes, he said, which is why the council of churches issued an appeal for unity and has clearly defined as “morally unacceptable” and “a crime” the attempt to use religious or cultural differences for political gain. The evening before he met the press, Archbishop Shevchuk and Ukrainians working in Rome joined the Sant’Egidio Community for a prayer service for peace. In a packed Basilica of Santa Maria in Trastevere, tears flowed as the archbishop led the singing of the Lord’s Prayer in Ukrainian. The lay Sant’Egidio Community, known for its promotion of interreligious dialogue and peace mediation, also runs Rome’s Basilica of St. Bartholomew, which serves as a shrine to the martyrs of Nazism and 20th-century communist dictatorships. The basilica’s side altars are filled with the personal belongings of people killed for their faith, including Ukrainian Catholics martyred after their church was outlawed in 1946. “Right now we have thousands of injured” and neighboring countries have offered to take those with the most serious physical injuries. “But there are also wounded hearts and souls,” he said, and their healing will require prayers and the services of the churches.